Create waves with a show-stopping metal headband! Hire this delicate piece for your next fancy bridal shower party or spring racing event. It features a metal headpiece adorned by clusters of clear glass beads intricately wired by hand. 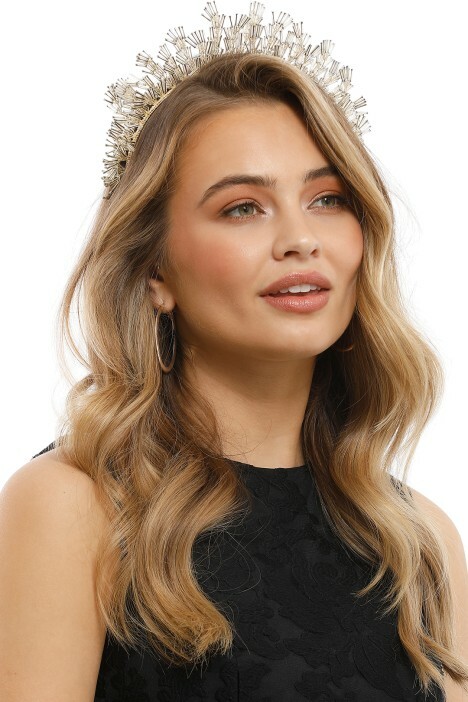 The perfect statement headpiece! Pair this stunning headband with a fit and flare mini dress or a simple pastel midi dress. To style further, hire a metallic clutch pod, add a pair of delicate gold drop earrings and slender black heels. For more hot styling tips read our ‘5 Fascinator Friendly Hairstyles’ blog post! Founded in 1995 by Polish-Australian Olga Lippman, Olga Berg is an on-trend accessories label prized on glamour and luxury. Drawing from global influences and infused with a unique Australian flavour, their clutches balance between the classic and the innovative. Her designs are known for their sophistication with a touch of sparkle.